It has been sooo long since I posted anything that today I thought I'd get caught up with all of you. I have been taking a break from card making an paper crafting and have entered the world of dolls. Yup, I'm hooked on the American Girl dolls (more likely obsessed). I used to sew when my kids were young then helped with the local dance studio doing alterations and specialty costumes. I even won a few design awards along the way. As my kids grew I made dresses for semi formals and proms. I even did quite a few of their friends. I backed off when it came to doing their wedding gowns. (I wasn't THAT brave). Fast forward to this past 2 years. I found I missed sewing and decided to make clothing for my grand daughters dolls. I have to admit I was a little rusty. I started taking design classes on line at Liberty Jane and now proudly test patterns for so very gifted and talented designers. I have taken Design, Pattern Making and lately the Couture Academy. Along the way I have met some sweet young girls who are so blessed with fashion sense and love their Historical dolls. I am amazed at the knowledge they have. However there is one incredible six year old who just loves her dolls. Her name is Kiley and I am so honored to have made some outfits for her. You see Kiley is battling Alveolar Rhabdomyosarcoma. After talking to her Aunt, she stated they were thinking of having a Yard Sale to raise money for Cancer Research for children. I thought they (or I) could raise more money by having several Auctions for the dolls instead. If she could donate some used dolls then I would gladly create custom outfits for them. Well, I received 3 dolls but they needed some TLC. At first glance they don't look too bad but on closer examination I knew I had my work cut out for me! Since all 3 will be going to Auction within the month I will focus on the first one I altered. She's the one in the middle. Yes, her hair has been cut so there was no saving this hair. What to do? Rewig. Yup, this is how I transformed her to become Sam. You can find plenty of You Tubes that show you how to do this so I won't bore you. I used a non-acetone polish remover to remove most of the old glue on the head and cleaned the face with a magic eraser. You have to be real careful not to let any water or liquid in the eyes or the develop "silver" eye ( a fancy way of saying it removes the color of the dolls eye) and will need a trip to the American Girl Doll Hospital! She looks to pretty to be a boy so I used some Copic Markers and added freckles and filled in the eyebrows for a bushier look. With the eyes closed it maybe hard to tell what I am going for but trust me, the wig improves it a lot. I had researched what other people use and some said colored pencils, others use acrylic paint. Both of those materials are water soluble so I used the Copics since they are alcohol based and should last longer. Yes, I was scared to use them at first but once I got started it was fine. Meet Sam. I used a cargo pattern I had but wasn't happy with the fit and the shirt is okay but I wanted to make a "muscle" shirt and it just wouldn't fit as a layer. Also, I have been in a quandary as to what he should wear on his feet: shoes or sandals? Since this will be my first Auction for a cause I need it to be perfect. Let's help these kids kick this! The next 2 dolls will become the ballerinas from Swan Lake. (Wait til you see them!). Good morning all you wonderful Pinquettes! 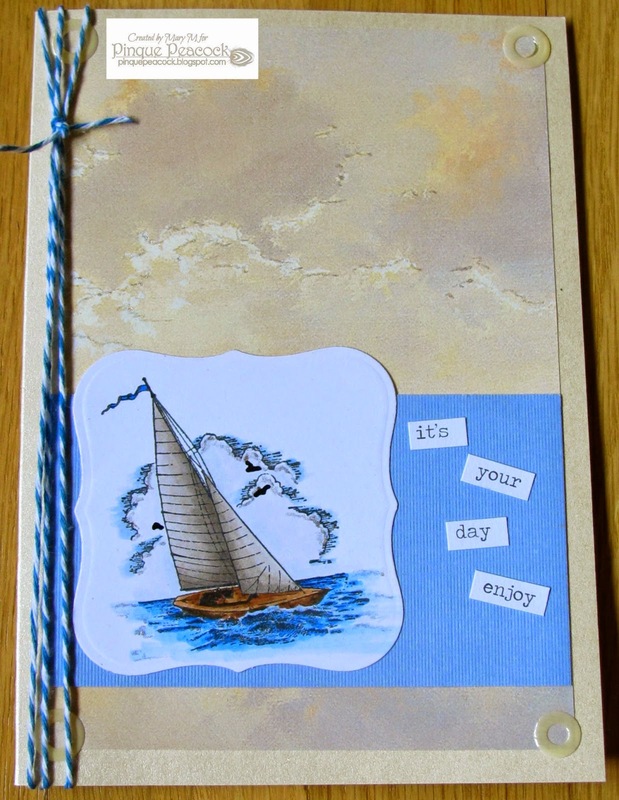 Mary here with my project for the September Challenge: stamping and journaling. This is our 9th challenge and a really fun one. Since I have twin adults daughters who have birthdays in October, I really have to plan ahead, lol. They love my cards but also love the tags I have been creating. It is hard to see in the picture but I stamped it first with the phrase, then added an acetate tag overlay. The rose detail was a die cut with my Cricut to which I added some stickles. To finish it off I added an off white 3 Girl Jam ribbon. Did you know Jess carries this gorgeous crinkle ribbon in the Pinque Peacock Shop? You can purchase some HERE. I plan to slip this tag inside one of these cute little manila envelopes. Yup, they are also available in the SHOP. Take a look around and you'll find the Stickles (glitter glue) there as well. I plan to add some handmade cards in this recycled cigar box and include the card inside. Can you find the angel stick pin? I purchased the box at Michael's and painted it with black paint then used Beacon's laminate to "paste" the paper in place. 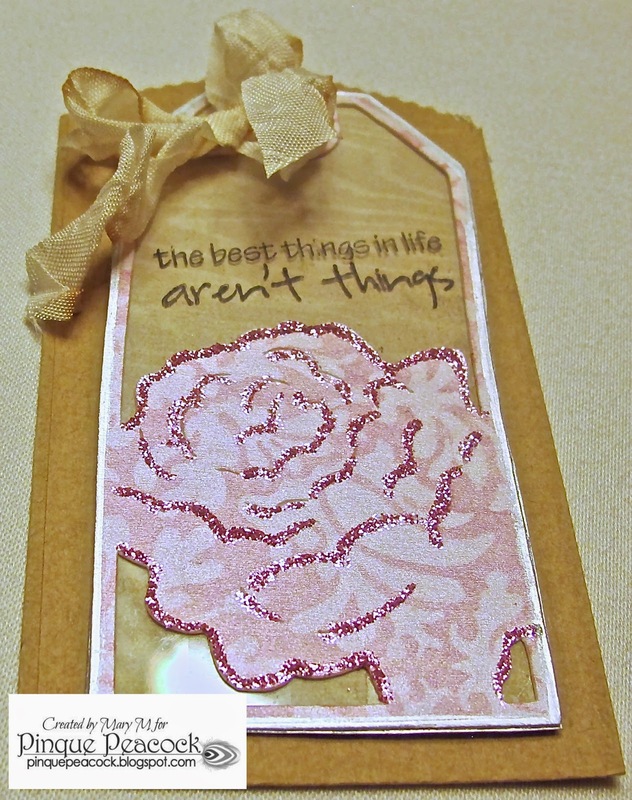 I also used some Tim Holtz music tissue tape for a little interest. In my stash I found this metal accent that says "be an original". I find this amusing since, although my daughters are twins, they are both originals! These metal flowers I had just went perfectly. The angel stick pin is so fitting on this box. Have you tried these yet? 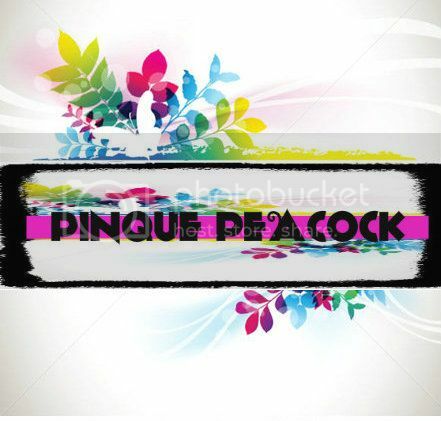 They are my all time favorite Pinque Peacock product. They can get some at the Pinque Peacock Shop. I just had to show you the front of my box. While I try to destash some of my supplies, I came across a strip of this soutache type braid and this lace bow. All I have left to do is make another box and fill both with cards. It's going to be a busy month! Now it's your turn to add your project to our challenge. You can just let your creativity take you to any direction that it wants to go! 1. You can create from and use any medium of your choosing: Paper, Fabric, Paint, Glitter, and More!... 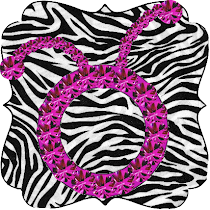 embellish however you like or want... must include stamping and/or jornaling on it!!! So, use your imagination Peacocks!!!! 2. You can enter up to 3 separate projects, but must have a separate blog post for each. 4. If you have used any Pinque Peacock Products on your Project, and you link to those products in the shop somewhere in your Blog Post or FB share, you will receive an EXTRA ENTRY into the prize drawing. 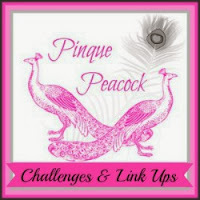 Just enter your name in the Linky Widget below with the word PINQUE next to your name. 5. Your project must be something you created after the start date of this challenge. 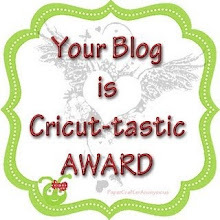 No back-linking to prior blog posts or projects will be permitted. Any entries not meeting these guidelines will not be considered in the Prize Drawing. 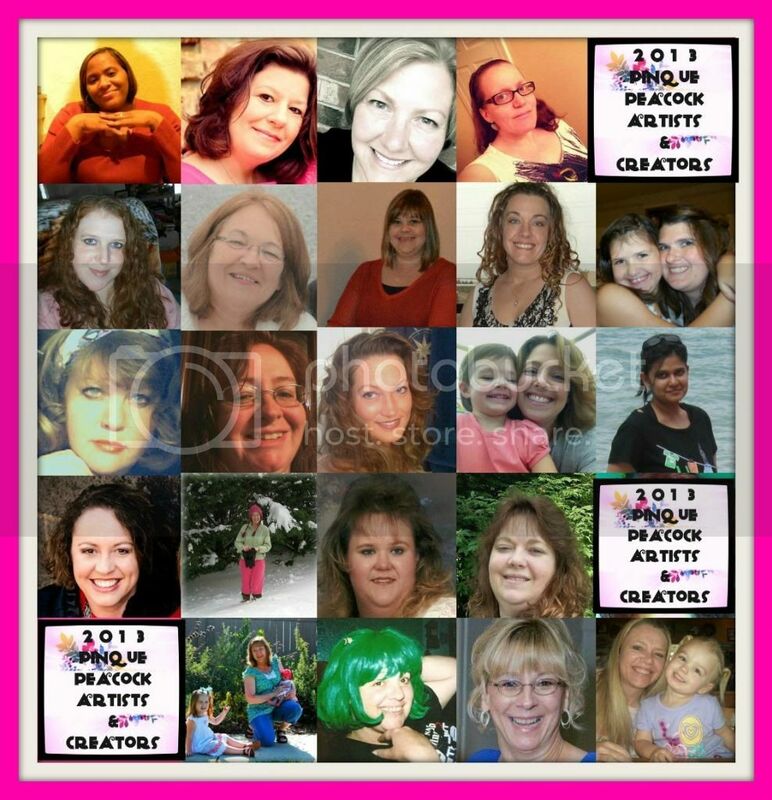 Be sure to peek in throughout the duration of the challenge, because we will be sharing more inspirational photos and tips to help get your Creative Mojo in HIGH GEAR!!!! You will have until August 31st to create and join us! There will be TWO (2) Prize Giveaways. 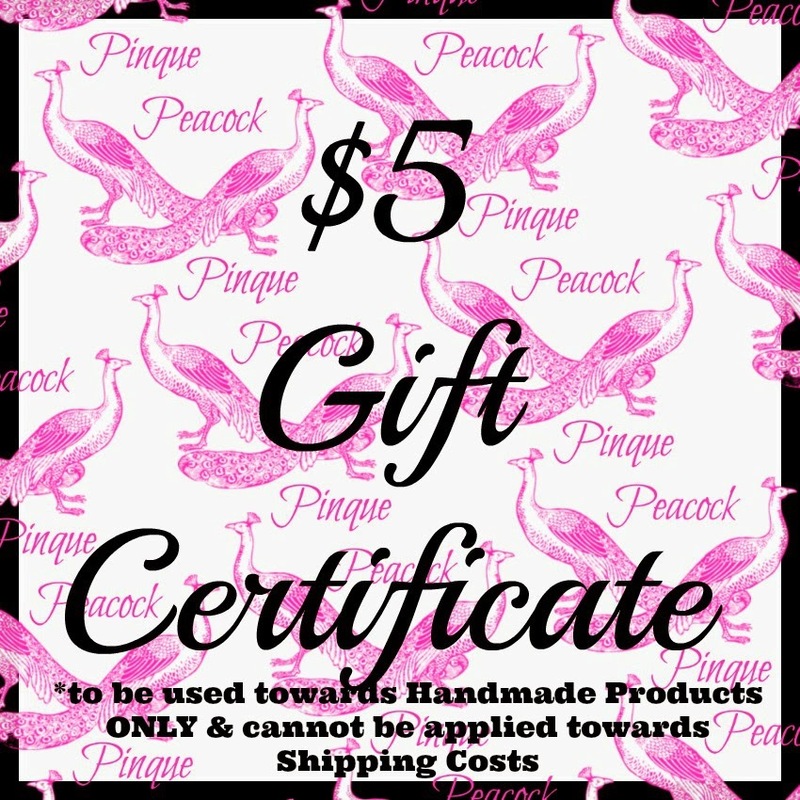 $5 Gift Certificate to the Pinque Peacock Shop. 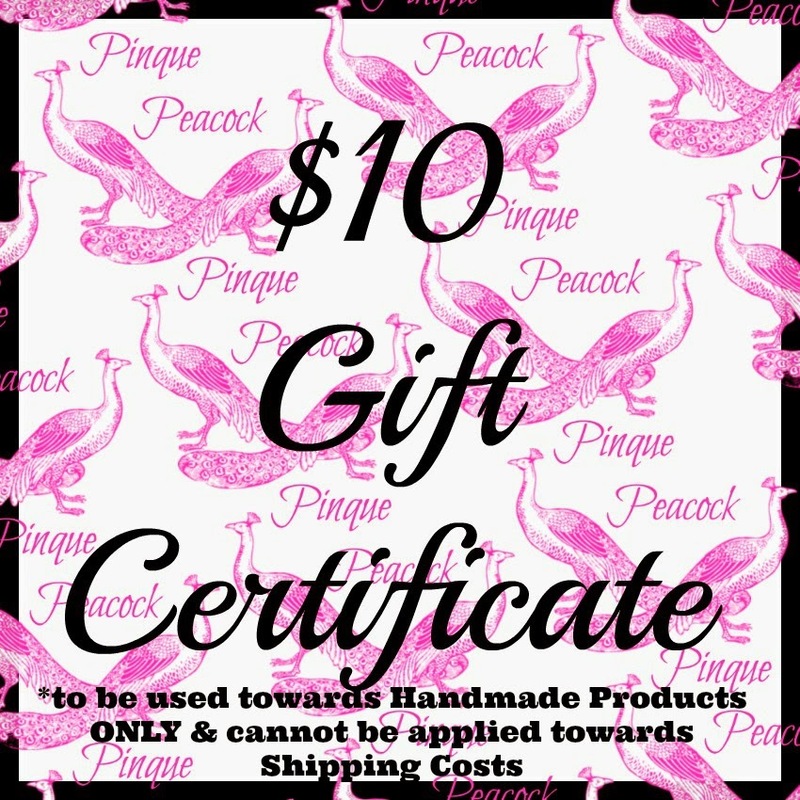 $10 Gift Certificate to the Pinque Peacock Shop. We are looking forward to seeing all of your beautiful PROJECTS and encourage you to tell all of your friends to join in the fun, too!!!! 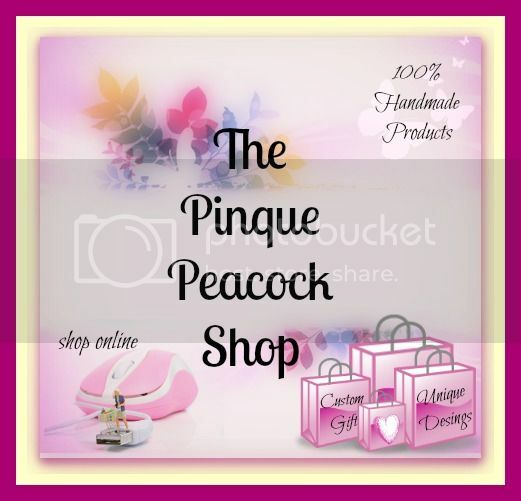 wonderful Handmade products and merchandise that are always available at Pinque Peacock. During the hop, you will see some past favorites, oldies but goodies, and get a glimpse of some NEW products as well! Feel free to browse the shop for amazing deals on tons of craft supplies and great handmade embellishments to use in all of your projects! Good morning, I am so delighted to have you stop by and see my project for the Hop. If you just came from Kimberley then, if not, You'll want to be sure to see her wonderful project on her BLOG. In keeping with our theme of Stamping and Journaling, I decide to create a card for my Husband who has a birthday coming up Tuesday. First the base card. I used a beautiful card stock from the Shop. It has a wonderful sheen to it and is a great weight. All projects should start with a quality base. You can find this and other card stock HERE. I chose this wonderful sailboat stamp and colored it with my Copic markers. 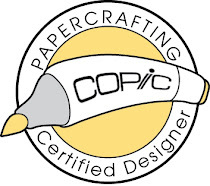 I have both Certifications from Copic and sadly I don't use them nearly enough so this was a wonderful challenge for motivation. I have noticed people using colored pencils lately and thought I'd add a little tip here. After you color your image try using Gamasol with a small blender over the areas you colored. It blends the colors in and makes it look like watercolors and gives a nice blended look. You can find gamasol in the art department at your local craft store. The background paper is Thomas Kincade and went so well with the scene I was trying to create. If you follow my blog then you know I love dimension and this card was no exception. I had gotten some sparkle gel pens from Jess so I used them to highlight the clouds and the waves. Just a few touches adds so much realism! I also used the Glaze black pen to make the birds stand out. Did you know the Pinque Peacock carries these pens? You can get them in the Shop HERE. The journal part was simple. I used Tim Holtz words, short and sweet but to the point don't ya think? I finished this off with some Bakers' twine and Voila my Hubby's card is done. Your next stop on the Hop is Rebecca and you don't want to miss seeing her project. However you might just want to check out the information below to enter your project in our September Challenge, who knows, you just might be our next winner!!! Our SEPTEMBER HOP will focus on the theme of our Monthly Challenge! 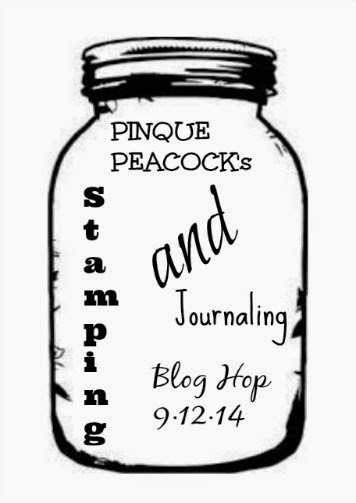 Please join us this month and LINK UP your Stamping & Journaling project to win some awesome goodies! 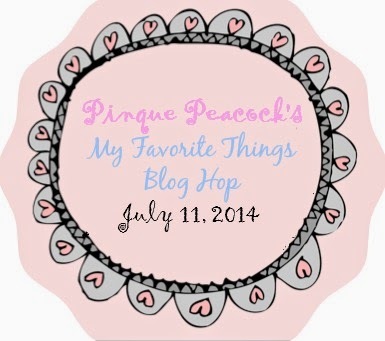 1 – Hop to ALL of the stops in the Blog Hop and comment at each Pinquette Blog. 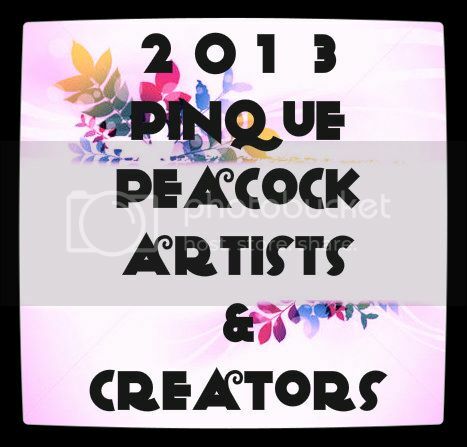 3 – Follow EACH of the Pinquettes’ Personal Blogs who are participating as Hop Stops. The Hop will remain open until Wednesday, SEPTEMBER 17th, at 8:00 a.m. EST. The random drawing will be held sometime during the week that follows and announced by Wednesday, SEPTEMBER 24th. Lineup to get back on the Right Track . . . This is an 8"x8" album that also serves as a journal. I wish I had made one taller and more narrow so it could fit the brochures and maps we collected of our trip. Yes, while my daughter, son in law and myself relied on our smart phones, my husband was more confident with a physical map. I have to admit that at times, he was more accurate! I have told you about all the goodies you get from the Crafty Kit Club that Jess offers. Well, the metal leaf, small mulberry flower and pearl dots came from the July Kit that Jess was kind enough to send me. I just love the metal leaf, It has a hole at the top so you could use it as a charm as well. I wanted to use this stamp but it just didn't pop until I found this epoxy frame in my stash and luckily the color matched perfectly! Once I added the flower the album looked complete. The inside has envelopes that I made to match the page which is a perfect pace to add a picture. I love to add a journal page to record all the highlights of your adventure. this actually is a year journal but would easily adapt to a Road Trip album where you could brochures, receipts and tickets from your trip. You can shop for the kits HERE. You get so many supplies that it is easy to create many projects. But wait..... there is still time to enter the Challenge for August (Sparkle and Bling). I am definitely going to enter this one. You can link up HERE. I hope you all have a wonderful week as the kiddos go back to school. That surely means more crafting for some, lol. You can also find more details about this project @ my blog. Hello fellow craft enthusiasts! Today I have a wonderful project to share with you. But first I have a confession to make. I lost my mojo. Yes, its true. For weeks now I have been trying to come up with something unique. Nothing, nada not even a flicker of an idea. I have been so busy making Elsa and Anna dresses for 18" dolls that my head was struck on FROZEN. I tried to let it go, I really did but, try as hard as I did, I still could not come up with an idea. Sparkle and bling, snow and ice, sparkle and bling oh Mary just let it go. So I pulled out my remaining supplies from the July Crafty Kit that Jess had sent me. After pouring over the goodies, there it was.... a bottle cap. At last some inspiration. Why let it go? Not me, so I decided to make a necklace of Elsa and Anna! First I googled an image of Elsa and Anna. Then I sized it in my Sil Cameo and printed it on Square 1 printable vinyl. After cutting it to the size of the bottle cap I added it to the cap and covered it with Mod podge. Of coarse you need Sparkle so I used some stickles on the edge of the image. Once it was dry I added an epoxy topper but you could also use triple thick or any jewelry coating. I used a piece of 1/8" ribbon and threaded it through the pearl beads with silver spacers. This particular bottle cap did not have a hole in it so I used a metal tool by Ranger. It still needed more sparkle so I thought, what about snow? Yup, that looks better. I did add a little more glitter while the snow was still wet. All that was left was to add a magnetic clasp. I think I have my mojo back!!! 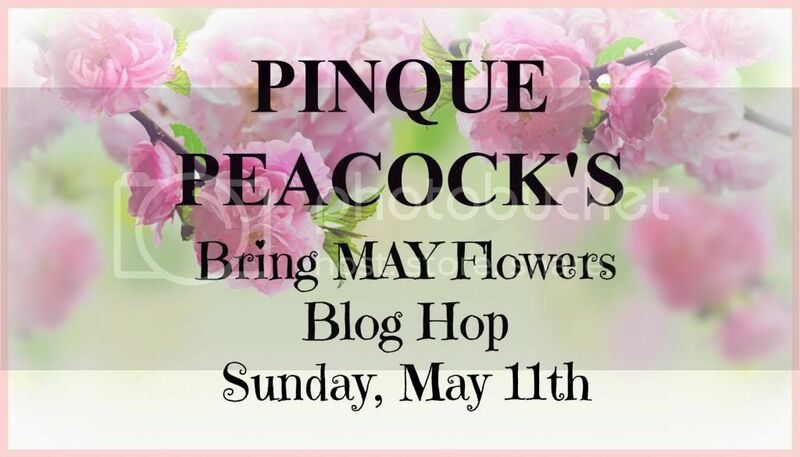 Also be sure to join our Blog Hop now in progress. That will get your mojo going!! !